Being that I was a 17 year old and had yet to form any personal beliefs, my friends and I decided that morning that we would enlist in the Army and go get Osama. Forget that most of us had post-high school plans (in my case, college). It was our duty as Americans, as people who had been blessed to grow up in a middle class, multicultural environment where we were taught from a young age how far this country had come in terms of tolerance, to protect our liberty and make sure the thousands who perished that morning didn’t die in vain. Three days later, my varsity soccer team played our first game of the season against Memorial High School of West New York, which is one of the small cities along the Hudson River across from Manhattan. Their team was made up of mostly first generation Hispanic immigrants and our team had a different, but similarly intriguing, makeup of kids with European, African, Jamaican, Hispanic, and Asian backgrounds. Before the game, each team lined up as the National Anthem was played and the American flag was raised. We could literally see and smell the smoke billowing from “Ground Zero” (although I don’t think it had yet been called that), and the image of these two predominantly minority soccer teams standing across from each other as the anthem played and the smoke billowed has stayed with me to this day. There are probably some uneducated people out there who read the OB Rag and question my patriotism. I have been called a pinko, a terrorist, Anti-American, etc. For those who feel that way, tell me where you were on 9/11. Tell me if you cut school to go down to the ferry landings along the Hudson River to give firemen from New Jersey departments a ride home after spending hours looking for survivors. Moments like the one I had prior to that soccer game have left me with an indelible and undeniable dedication to this country. That is why it pains me so much to see us fighting wars overseas when we have our own battles with poverty, hunger, and homelessness going on right here at home. Looking back, it was probably a good thing for me that instead of enlisting in the Army on 9/11, I got together with some friends and got stoned. Over the course of my four years at Ithaca College, I learned about the atrocities of war and the value of non-violence. I am now a pacifist through and through, and at the time formed fairly radical opinions regarding the military. I had come to the foregone conclusion that anyone who joined the armed forces was continuing centuries of imperialism that had made America a polarizing world power in global politics. Even if someone never fired a gun in combat, in my mind they were still somehow killing women and children in wars that had nothing to do with democracy and everything to do with our economy. Since moving to San Diego a little over a year ago, I have begun to take on a more understanding viewpoint regarding the men and women who serve in the armed forces. While I still identify as a peacenik, a pacifist, a quasi-socialist, and a progressive, I have formed close friendships with people who served or are serving in the military. Through these friendships, I have learned that most people enlist not because they are war mongers, but instead to build a career and take care of their families. I have also begun to learn that while these brave soldiers are risking their lives overseas, some are undoubtedly questioning why they are there – which I take some solace in. These folks are dedicated to protecting our freedoms, despite the fact that the wars they are fighting are becoming less and less popular as time wears on. 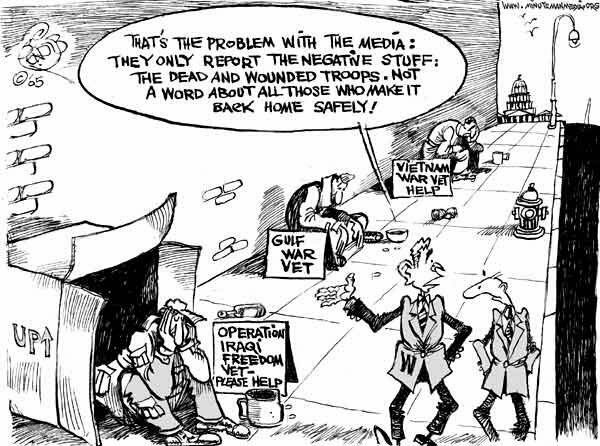 As I have begun to further appreciate veterans’ dedication and patriotism (while still disagreeing with our presence overseas), I have also started to question why about 200,000 military veterans are homeless. It is ironic and utterly despicable that after protecting and serving this country, the country has done nothing to protect and serve them back. Presented with one-on-one accounts from homeless veterans, outreach workers, advocates, and politicians, the viewer is continuously reminded that most combat veterans are suffering from some form of mental illness related to their experiences at war. Post Traumatic Stress Disorder is the prevailing illness in the lives of veterans, and the documentary does an excellent job of explaining the vicious cycle that can lead once functional, affable, dedicated people into extreme mental illness and eventually, homelessness. The statistics provided in the documentary regarding homeless combat veterans are jarring: 10% of California’s military veterans live in San Diego, and somewhere between 30% and 40% are homeless – putting that population at somewhere between 2,000 and 4,000 people. Veterans Village of San Diego Treatment Center director Gary Parker estimates in the film that 40% of San Diego’s homeless are veterans. 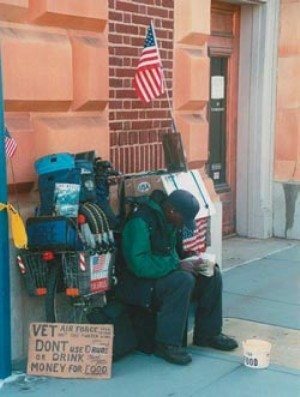 If those statistics are somewhat close to true (my personal experience has led me to believe that statistics regarding the homeless are well below the reality, due to the difficulty in collecting hard data) that means we have at least 2,000 homeless veterans here in San Diego – most of which have extreme cases of PTSD. In consequence of not getting proper psychiatric and medical treatment upon returning from combat, many of these people have concurrent drug and alcohol addictions. Here in America’s Finest City, we have thousands of people just like that living on our streets. The documentary primarily recounts the services provided by organizations dedicated to military veterans. One of these organizations, Veterans Village of San Diego, formed in the early 80’s by Vietnam Veterans struggling to make it on their own. It has now become one of the most successful and well-regarded homeless recovery programs in San Diego. On its website, the Village is described as having originally started “as a social model” that is “now integrated with structured case management and mental health therapy”. Veterans Village is unique in that it has services that address mental health, addiction, medical needs, family issues, and employment training all in the same place. They also have a sober living program for veterans who pass through their recovery programs that will soon be able to house over 200 people – making it an all encompassing service center for people who need it the most. Another organization/annual event depicted in the film, Stand Down, is targeted more at those who are not yet comfortable seeking assistance from a systemic organization like the Village but may still benefit from attending a one-time event where they can learn what is available to them and seek help. Stand Down, which began here in San Diego two decades ago and has now become a nationwide event, is credited with being the first prominent event to bring attention to homeless veterans. While the two are not directly related, Stand Down can be seen as a gateway to the services provided at places like the Village (which were not available at the time veterans were returning from Korea or Vietnam) and might provide new information for someone who has been living on the street for many years but has yet to seek help. Throughout the film, service providers are optimistic for the future of returning combat veterans due to the advancement in services available today as opposed to thirty years ago. There is concern, however, that the sheer number of veterans returning from the wars in Iraq and Afghanistan will make it difficult to reach everyone who needs help. According to the Patrick McCaffrey Foundation, as of July 2006 approximately 18,490 soldiers had returned from Iraq and Afghanistan with major injuries. Imagine how that number has grown in three years. The signature injury of the current war is brain injury that may not show full effects until later on, and the worry is that the people who do not properly treat these injuries may inevitably fall into homelessness and drug addiction – the same cycle all over again. Much has been said recently about the changing face of homelessness, as more families and individuals are being forced to the streets by the deepening recession and the inevitable job losses that come with it. This documentary, and more importantly the work of organizations such as VVSD and Stand Down, remind us that the face of homelessness really hasn’t changed all that much. It is a defining characteristic of American culture when those who literally risk their lives to protect our freedoms are left to fend for themselves when all they really need is preventive support. It is also characteristic of our lack of compassion to the homeless in general; if we didn’t turn such a blind eye to those living on the street around us, maybe veterans wouldn’t be at such high risk of becoming homeless in the first place. During the documentary, the idea of seeking out homeless veterans and offering help rather than making them come and find it was brought up a number of times. Maybe the “Invisible Ones” are too proud, embarrassed, or mentally ill to come forward on their own – but those barriers should not prevent us from providing them with services in a dignified way. I am personally conflicted on this issue; on one hand, more people would utilize services if they are brought right to them. On the other hand, if someone has to find their way to a service provider on their own, it shows they are dedicated to getting help. In the case of veterans, however, the barriers to seeking help (drug addiction, PTSD, paranoia) brought on by living on the street are so influential that word of mouth may not be enough. Inevitably, much of the impetus is on us. Although part of the stimulus package extended benefits for veterans, it is through citizen action that true legislative change will come. If we are going to reach the unreachable, we all have to chip in. Overall, I thought the documentary did a great job of presenting homelessness amongst combat veterans as a problem we all need to take interest in – not just those who “support the troops” overseas. If you are like me and want to put an end to wars and violence, it is imperative that we publicize the devastating effects on long term mental health and well-being that wars have on soldiers, their families, and inevitably, the communities they return to. As Dr. Jon Nachison, co-founder of Stand Down and a Vietnam veteran himself, stood inside San Diego’s winter shelter tent, he philosophized on the irony of society’s treatment of homeless veterans: “I’d like to see a day when we don’t need to shelter people in a tent like this. Because one of the things I wonder is are we sheltering the vets or are we sheltering the people out there from seeing the vets”. Great piece Lane, nice work!!! Lane, this was a very thoughtful piece. We thought that you did a beautiful job on this issue. Our desire when producing this documentary was to make our fellow Americans aware of how our homeless veterans are suffering, after having risked life and limb for our freedoms. You really got it. After having been a writer for 40 years, your artaicle moved me and brought a tear to my eye. Thank you for bringing awareness to your readers about the travesty in our own backyard. Now let us all pitch in and do something to help our veterans. Thank you…you have no idea what that means to me. Having spent four years studying film and tv, I really appreciated the documentary – I know how much work and planning goes into it from personal experience, and I know it isn’t easy when the subject is so difficult to bear. Speaking of pitching in – San Diego Stand Down is still looking for volunteers for the annual event in mid-July. I am going to be volunteering one of the days, and probably writing something for the Rag another day. For anyone who is interested in helping, go to http://www.vvsd.net and click on Stand Down. There is a laundry list of volunteer opportunities throughout the three day event as well as data entry needs between now and well after. It is most certainly an event that requires our attention, as San Diego is really one of the places at the heart of this issue. Right on, well written too. Excellent piece Lane, well-thought, well-written, and very moving. I remember waking up to the news of the first plane striking on 9/11, myself a youngster exploring sociology as a freshman at a local junior college (the first of my three freshman years). My friends and I went through the same range of emotions you described, as likely did a good chunk of our generation at that time – anger, a demand for revenge, a call to serve. We were all ready to go kill us some terrorists…a few of us enlisted, most of the rest of us just got stoned. We saw the damage that our misguided wars eventually brought upon ourselves and our would-be allies as much as our enemies, and we turned against the military. We forgot how willing we once were to serve, and questioned how anyone could conscionably volunteer to inflict such pain upon the world. And our friends that had left began to come home. One missing some toes and most of his hearing, another who claimed he’d gone weeks at a stretch without sleep. All very lucky, most jaded with the experience to some extent or another. All human, manlier versions of the boys we’d known just a couple years earlier. The people I knew have families with the resources available to care for them, and again I state (as would and have they) that they were the luckier ones. My hat goes off to you for the work you do, and to you and all the rest of those that shine light on the sorry situation that too often confronts our veterans upon their return.